Fortnite has been kicking around for much longer than a fortnight. It’s been undergoing a lot of work since it was first revealed at the Video Game Awards in 2011. Nearly a full six years later, on July 25, 2017, it will finally be getting a paid early access release, with 2018 bringing the full free-to-play version to market. It’s been a long time in the making, but obviously Epic Games is confident in the idea. My E3 2017 presentation of the game gave me a chance to go through the tutorial and some of the early missions, learning the ropes and getting a feel for what exactly Fortnite is. No developer wants their game to be compared to other games, but gamers like to have an idea of what they are getting into. 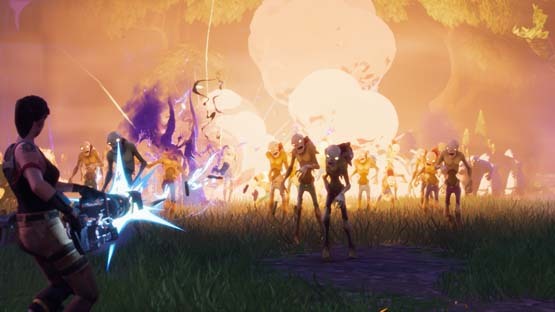 At a very basic level, Fortnite is Minecraft meets a wave based zombie-horde shooter, but that’s an oversimplification that really fails to do Fortnite any justice. Each level is played in three different rounds. There’s the exploration and materials gathering phase, followed by the building of your fort and defenses, and finally the timed waves of monsters that come flooding towards you, testing your fort to see if you were able to aptly build something that can repel the horde. If your fort isn’t good enough, or you just want to repair and upgrade what you’ve got, you can build on the fly during the waves of enemies. My primary concern about this mechanic is that it would become cumbersome to effectively get to what you needed. I imagined something like trying to build a house in The Sims while also attempting to repel a fleet of monsters intent on tearing down my base and killing me, but it was surprisingly much easier than that. The buttons are smartly mapped out to quickly access what you need to build, and the cursor will automatically adjust for if you are building a wall, floor, or ceiling piece. It’s also simple to quickly switch between this and combating the waves of zombies with whatever character you choose. As you play with friends in up to four person co-op, you’ll unlock rewards, sometimes giving you more building materials, other times new heroes. This is where the free-to-play aspect will come in when Fortnite launches fully in 2018, essentially acting like loot boxes that can give you a variety of things. They’ve gone a long way in making sure it isn’t pay-to-win though. These rewards can also be earned in the game through regular playing. Microtransactions will just help grease the wheels and get you rewards, materials, and new heroes faster. After the tutorial, I was surprised with how much the game really opens up to allow for a ton of different options. Different character builds, abilities, weapons, a skill tree that is enormous, the massive map of varying levels that are all procedurally generated, and that’s just what I could make sense of. The menu holds even more that was admittedly a little overwhelming to comprehend in the brief window I had to see the game. The developers told me that they will work on making the customization and full options of the menu unfold slowly for new players upon the free-to-play release, to assist with accessibility, but aren’t targeting that for the paid early access because they figure most of those players will be gamers who are already familiar with most of these types of systems. Fortnite was a real surprise, something I can see myself losing hours of time in as I play with friends and look to get the best characters and loot. 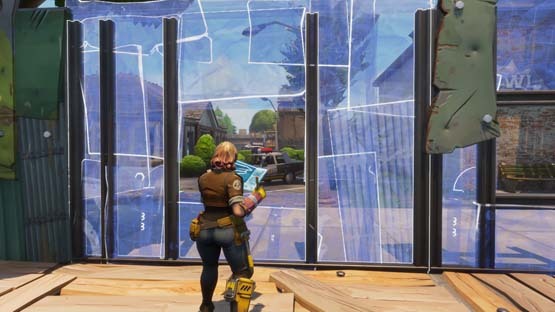 It’s been a long time coming, and from what I can see, Epic has put an incredible amount of work into making sure it releases right. With th paid early access, we can expect to see even more improvements over time as the masses get their hands on it, but don’t think this is one of those games that is in early access because it isn’t done. Fortnite shows an impressive new way of playing a third person tower defense action game that soon everyone will have the opportunity to enjoy. Fortnite release to paid early access on July 25th, 2017 for PS4, Xbox One, and PC. Free-to-play release will come in 2018. Check out all of our E3 2017 coverage.